PR NewswireLEXINGTON, Ky., April 15, 2019 /PRNewswire/ — Tempur-Pedic, the brand synonymous with innovation in the mattress industry since 2012, is today unveiling the TEMPUR-breeze® mattress line, the first capable of keeping you cool from when you first get into bed, as you fall asleep, and throughout the night. Tempur-breeze® will help you feel up to 8 degrees cooler through the night. When you lie down: The high molecular weight yarn in the SmartClimate® Dual Cover System delivers a cooling sensation up to 30 percent more intense than non-cooling models. Thermal effusivity tests—which measure heat absorption—confirm this cool-to-touch yarn absorbs heat throughout sleep, continually feeling cool as you roll over and adjust. With a washable, easy-to-remove cover that features a patent-pending 360-degree zipper system, cooling effects will not diminish. As you fall asleep: At about 80°F, the molecules within TEMPUR-breeze’s most efficient Phase Change Material (PCM) to-date, PURECOOL+™, activate, shifting from a solid to a liquid to absorb massive amounts of heat. For the first time, Tempur-Pedic’s scientists successfully altered these proprietary molecules to deliver more phase change material, increasing its capacity to absorb heat by 2x compared to other PCM. Staying cool all night: In an unprecedented engineering feat at a cellular level, TEMPUR-CM+™ comfort layer is up to 10x more porous to more effectively channel heat and humidity away from you all night long. For the first time, both phase change and climate materials are integrated into the bed’s top layer where they’re most effective. 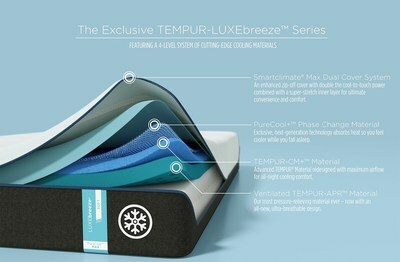 TEMPUR-breeze delivers the highest performing cooling system and most advanced pressure-relieving material in one mattress. On a molecular level, the ability to combine Tempur-Pedic’s pressure relieving, adaptation and motion-isolating properties with open-cell foam material is an industry-first. Tempur-Pedic is the only brand to successfully engineer this into soft, medium and firm feel preferences. From cover to core the TEMPUR-PRObreeze™ and TEMPUR-LUXEbreeze™ mattresses combine the best cooling performance and pressure relieving properties in Tempur-Pedic’s history. The new TEMPUR-breeze line includes PRObreeze™, which features three-level cooling system and feels up to 3 degrees cooler through the night. It’s available in medium and medium hybrid and retails at a price point of $3,799 for queen-size. The LUXEbreeze™ also includes the company’s most advanced pressure relieving material in a ventilated TEMPUR-APR® support layer, delivering even more breathability and cooling comfort for four-levels of cooling technology. As a result, it feels up to eight degrees cooler through the night. Available in soft and firm versions, the LUXEbreeze retails at $4,499 for queen-size. Tempur Sealy International, Inc. develops, manufactures, and markets mattresses, foundations, pillows and other products. The Company’s products are sold worldwide through third party retailers, its own stores, and online. The Company’s brand portfolio includes many highly recognized brands in the industry, including Tempur®, Tempur-Pedic®, Sealy® featuring Posturepedic® Technology, and Stearns & Foster®. World headquarters for Tempur Sealy International is in Lexington, KY. For more information, visit http://www.tempursealy.com or call 800-805-3635.